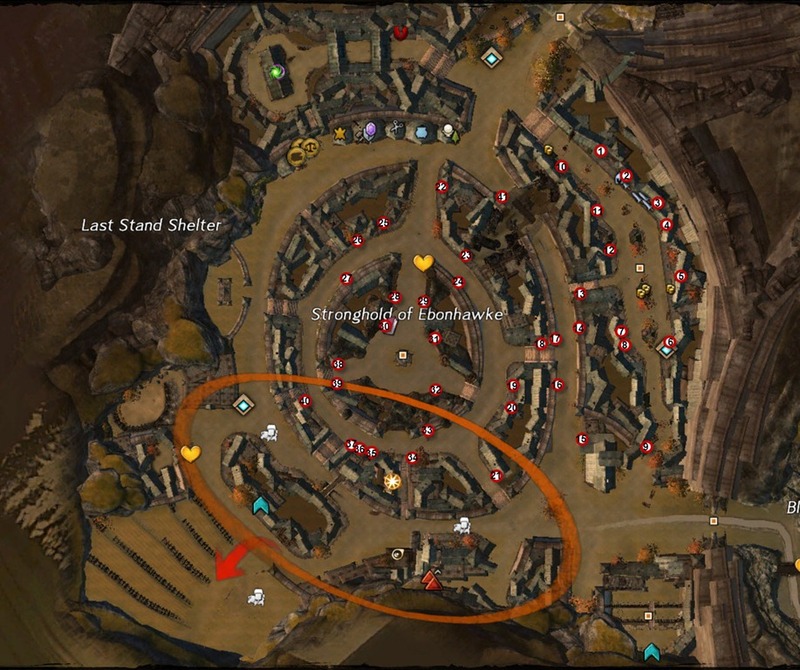 GW2 Cleaning Up the Neighborhood achievement guide with map and location of all 41 Separatist Propaganda you need to tear down for this new Explorer achievement added with July 9 patch. You will need to find 41 Separatist Propaganda in Ebonhawke (Field of Ruins). Here is a map of all of them to help you locate them. Did it track it as you did it ? I just did books yesterday I got the chiev. It’s not working on my end either. Tore down all the posters, isn’t keeping track on the achievement tracker and haven’t gotten achieve yet. I’m sure it’ll be fixed soon hopefully. The books worked for me the second time (I think I missed #6 first round, despite going to where it was) and tracked each one as I read them to ensure it worked, however I did the same with the posters and they still didn’t register for me, so I suppose I’ll try again tomorrow. Does it matter in what order you destroy them? where is the 41st poster? Ty Dulfy, im going mad I think, still not got achievement and I’ve ran through them all twice and all are torn down. I think I remember doing something like this for one of the hearts, or something, it’s been a while. Been around twice after failing to get the achievement first time around and still was unable to find any others?? bugged perhaps? I just did this. I followed the guide and did NOT get the reward. However, I then went back through the city and combed through it all. Somehow, during the process of tearing them all down, the #3 poster respawned. I know I tore it down the first time as I compared where I was on the map with the dulfy guide as I did them. So, I believe the guide is correct but the posters themselves may not behave as intended when it comes to respawning. If you can’t get it to work, sweep the area again and look for something that’s come back. Edit to mention when I tore down that #3 poster the second time I got the achievement. A guildie and I went through and got every poster and never had one register at all. Bugged. They don’t register, once you get all 41 posters you just get the achievement. In theory. I did this twice over the course of a couple days and never got the achievement. I used your guide plus held down control to make sure I wasn’t missing anything. Still no achievement. Just did this and got all 41 does not appear to work. Went back and checked number 3 poster and it had not respawned. Ran the whole map and none have respawned. No achievement. I just finished it, no tracking occurred but i had missed poster 5 on my first sweep and when i tore it down I received the achievement. Theres some pretty well-place ones to miss, high on walls, etc. One I missed was around 3 or 4, it was on a wall slanted inwards behind a cart so I totally missed it even with ctrl highlighting. The achievements have changed and it’s now under the “exploration” tab. I was helping someone to find them and he found them all and forgot where the ones I didn’t have were. lol. #28 was the last one I couldn’t find for some reason so thank you for the map. Same here, just did this and it didn’t work, even though I double checked all 41 posters. Edit : tried with another character and it worked. This worked for me, I was missing poster #3 until I used this map. Got the achievement! I didn’t get it at first, followed one poster’s suggestion to try again on a different character, and that worked. Your map was a great help. I did them all in one day. They did not register, but when I got them all, I got the achievement. It wored for me too, thank you !